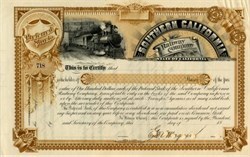 Beautiful partially issued certificate from the Southern California Railway Company printed around 1889. This historic document has an ornate border around it with a vignette of a steam locomotive. This item has the original signature of the Company’s President, George C. Magoun and is over 124 years old. Punched cancelled. George C. Magoun (August 25, 1840 – December 20, 1893) was, in the late 1880s, the Chairman of the Board of the Atchison, Topeka and Santa Fe Railway. Magoun was born in Cambridge, Massachusetts. He received a public school education, then entered employment with Stimson, Valentine and Company, a paint manufacturer in Boston. He left his sales position with that firm in March 1867 to become a clerk for Kidder, Peabody & Co.. After a quick series of promotions, the company sent him to New York City where he would open a branch. Four years later, in 1871, he was a full partner in the firm. Magoun and his company invested in the still growing Atchison, Topeka and Santa Fe Railway to the point where he had become Chairman of the Board for the railroad. In the late 1880s, as the Santa Fe's stock prices fell from $140 per share to around $20 per share, Magoun's health also faltered. Magoun died on December 20, 1893. He had become so personally identified with the railroad that three days after his death, the Santa Fe entered receivership. In 1888 a short line was built from Los Angeles to Fallbrook Junction to connect with the California Southern. This shortened the traveling distance between the two cities and foreshadowed the abandonment of the interior line. The California Southern was officially made a Santa Fe branch line in 1889. That year it was combined with the California Central Railroad and the Redondo Beach railroad to form the Southern California Railway Company. To reach Los Angeles, the Santa Fe leased trackage rights over the Southern Pacific from San Bernardino on November 29, 1885, at $1,200 per mile per year. Naturally, the Santa Fe sought ways to reduce the fees. On November 20, 1886, the Santa Fe incorporated the San Bernardino and Los Angeles Railway to build a rail connection between its namesake cities. California Southern track crews performed the construction work, and the first train on the new line arrived in Los Angeles on May 31, 1887. During the construction, Santa Fe officials worked to consolidate the many subsidiary railroads in Southern California in order to reduce costs. At a stockholder meeting on April 23, the eight railroads and their prominent stockholders, minus the California Southern, voted in favor of consolidation, and the California Central Railway was formed as a result on May 20, 1887. After the consolidation, although the California Southern remained a separate subsidiary, the National City shops were downgraded and the services provided there were moved to the newly constructed shops in San Bernardino. One of the first official lists of stations on the California Southern and California Central railroads published on July 13, 1887, shows the California Southern divided operationally into two divisions: the San Diego division covered the territory between National City and Colton; from there, the San Bernardino Division covered the route through Cajon Pass to Barstow. Santa Fe's California Limited pauses at the summit of Cajon Pass in 1908. The Santa Fe underwent a massive financial overhaul in 1889. The major investors in Boston, Massachusetts, were mostly replaced by investors from New York and London at the annual meeting on May 9. The investors replaced the company's board of directors with a new board that included George C. Magoun (who would later be linked with the company's 1893 receivership). The new investors disliked the number of subsidiary companies and sought to further consolidate them. The California Southern, California Central and Redondo Beach Railway companies were consolidated into the Southern California Railway on November 7, 1889. The Santa Fe finally purchased outright the holdings of the Southern California railroad on January 17, 1906, ending the railway's subsidiary status and making it fully a part of the Santa Fe railroad.